Vacuum Assisted High-Speed Integrated Technology A large 22×35 mm spot size enables the use of low-fluence and with a unique mechanism for pain reduction provides effective, fast and comfortable treatment. 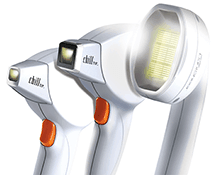 ChillTip™ Technology – Integrated contact cooling provides epidermal protection for treatment areas requiring precision and higher fluence. The HS has a HIT 22x35mm spot size enabling use of low-fluence and a unique mechanism of pain reduction, providing, fast and comfortable treatment. The ET has a Sapphire ChillTip spot size of 9x9mm designed to treat small areas that require maximum precision and higher fluence. Intuitive presets for fast learning curve and easy treatment delegation. Hair removal, permanent hair reduction, and the treatment for Pseudo Folliculitis Barbae (PFB).